Learn, live, love and grow. That is all there is to know. After my professor from Portfolio class said that the idea for this particular campaign did nothing for him, I decided to get insight from another professor and also peers. My other professor thought that I should run with it. She loved the idea. And after speaking with a few of my peers, I decided that the concept of using hip-hop artists was smart for Monster Beats by Dr. Dre. And so, I felt that if executed correctly, this campaign has the potential to resonate with a particular niche group of hip-hop audiophiles. Below is a print campaign for Monster Beats by Dr. Dre Headphones. 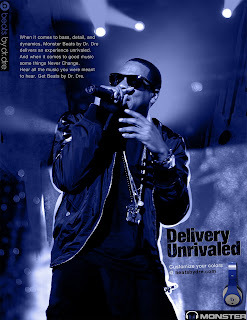 It utilizes three legendary hip-hop artists (Nas, Eminem & Jay-Z) to reach out to a niche audience of hip-hop audiophiles. I used these artists in particular because they areperhaps 3 of the greatest hip-hop artists still living. Among hip-hop circles, everyone knows who they are and what they have to offer. 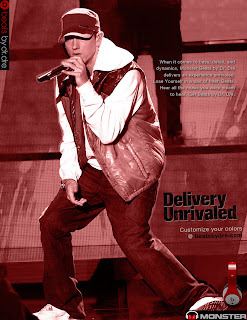 Their delivery on the microphone is sick, and any avid hip-hop fan knows that. In the execution, I went for an urban, street vibe. The use of color was to make the reader aware of the color customization of the headphones. 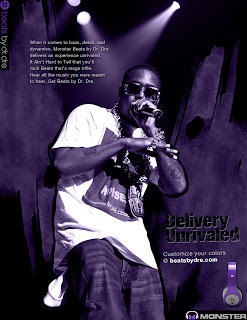 The copy is changed slightly for each ad, subtly mentioning a popular song of each artist.